A country with one of the highest economic growth rates in the region in the last decade, the Dominican Republic faces one important challenge: to balance a higher level of indebtedness with its high poverty rates (40 percent) and its weak equity conditions. In addition to limited poverty reduction, people have had little opportunity to escalate socially and economically to reach the middle class, with just under 2 percent of the population in the DR experiencing upward socioeconomic mobility, in contrast to 41 percent in the LAC Region. Whereas the country has succeeded in recent years in providing greater access to a spectrum of basic services, there is still high persistence of people that are not only poor in monetary sense but also deprived of the basic goods and services to enjoy fully productive lives. 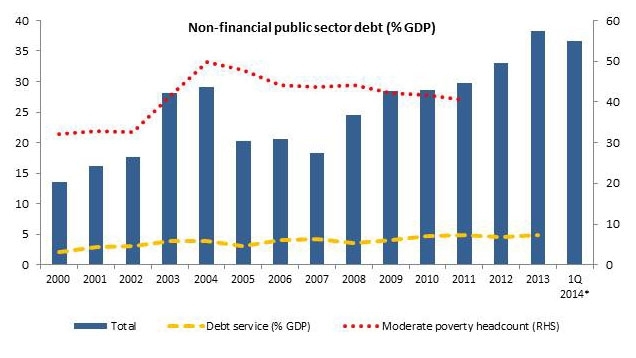 Source: General Public Credit Directorate of the Dominican Republic and the World Bank. * For Q1 2014 data reflects actual debt incurred in the first quarter of 2014 to projected GDP for 2014. Undoubtedly, high levels of debt can slow down growth (Reinhardt and Rogoff, 2010) and transfer the financial burden to future generations. In countries with limited revenue generation capacity, growing interest and principal payments may squeeze government’s budget and crowd out other expenditures much needed by the poor. At the same time, countries with limited resources may borrow now to invest in physical and human capital (by investing in roads, schools, health centers, etc. ), in a context of institutional and governance strengthening, expecting to improve equity conditions and the foundations for robust, sustainable and inclusive growth in the future. In sum, it is difficult to predict the net effects of the current increase in debt in DR on poverty and inequality. At the same time, it is worth ensuring that debt levels are on a sustainable trend, since high debt levels could hamper growth, increase macroeconomic volatility and, ultimately, provoke a fiscal crisis, which in turn would negatively affect the poor. some good analysis...but how about Greece ? In my opinion, Dominican Republic's debt still is sustainable as long the debt rate as a percentage of the gdp does not growth at a faster rate than the economy. If the DR continues to produce the same percentage of economic growth that it has been producing in the last decade, debt would not jeopardize it development and stability. However, I must agree that inequality still is a pending duty in the agenda of the government, but as long as wealth find it way to be redistributed, we may see a more citizens joining the trench of the middle class. The financial position of the United States includes assets of at least $269.6 trillion (1576% of GDP) and debts of $145.8 trillion (852% of GDP) to produce a net worth of at least $123.8 trillion (723% of GDP)as of Q1 2014. The U.S. increased the ratio of public and private debt from 152% GDP in 1980 to peak at 296% GDP in 2008, before falling to 279% GDP by Q2 2011. The 2009-2011 decline was due to foreclosures and increased rates of household saving. There were significant declines in debt to GDP in each sector except the government, which ran large deficits to offset deleveraging or debt reduction in other sectors. As of 2009, there was $50.7 trillion of debt owed by US households, businesses, and governments, representing more than 3.5 times the annual gross domestic product of the United States.As of the first quarter of 2010, domestic financial assets totaled $131 trillion and domestic financial liabilities $106 trillion.Tangible assets in 2008 (such as real estate and equipment) for selected sectors[c] totaled an additional $56.3 trillion. Historically, the US public debt as a share of Gross Domestic Product (GDP) has increased during wars and recessions, and subsequently declined. The ratio of debt to GDP may decrease as a result of a government surplus or due to growth of GDP and inflation. For example, debt held by the public as a share of GDP peaked just after World War II (113% of GDP in 1945), but then fell over the following 35 years. In recent decades, however, aging demographics and rising healthcare costs have led to concern about the long-term sustainability of the federal government's fiscal policies. On April 29, 2016, debt held by the public was $13.8 trillion or about 76% of the previous 12 months of GDP. Intragovernmental holdings stood at $5.3 trillion, giving a combined total gross national debt of $19.1 trillion or about 106% of the previous 12 months of GDP. $6.2 trillion or approximately 45% of the debt held by the public was owned by foreign investors, the largest of which were the People's Republic of China and Japan at about $1.25 trillion for China and $1.15 trillion for Japan as of February 2016. Dominican Republic has a false growth, as it is based on the billions of monies borrowed from Wall Street, during the last 10 years. Now, they keep borrowing to pay interest and principal, and are having difficulties finding money to pay the debt. They will claim banckruptcy soon.